As described in the blog How do I migrate a XenApp worker group structure, we saw how the use of Delivery groups, application groups and tags allow us to replicate XenApp 6.5 worker group capabilities to XenApp 7.x. There are some operational differences between Worker Groups and Delivery Groups, namely, how do increase the capacity of the delivery/worker group. One of the more interesting capabilities of XenApp 6.5 worker groups was in the ways an admin could increase worker group capacity. By adding a server into a worker group, the capacity of the worker group increased. Many organizations took this approach a step further by basing worker group membership on Active Directory group membership or Active Directory OU membership. 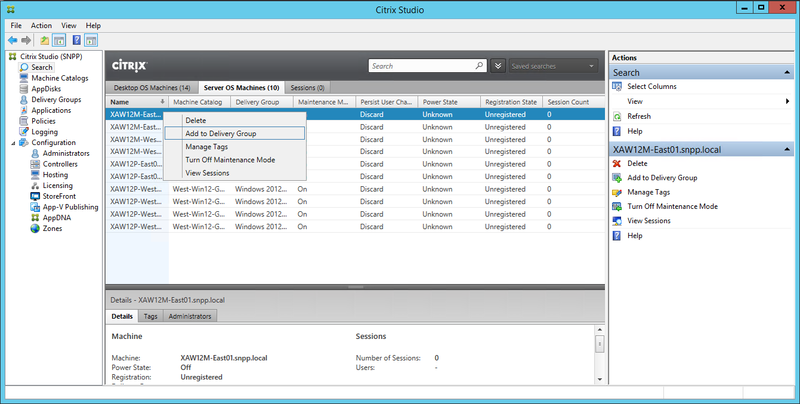 In the XenApp console, each worker group was assigned to a single Active Directory group or OU. Any server in the Active Directory group or OU would be a member of that worker group. To make this possible, you duplicate the worker group structure into Active Directory as groups or OUs. If I have 3 worker groups, I have 3 Active Directory groups or OUs. When a worker group requires additional capacity, the admin would add a XenApp computer object into the Active Directory group or OU. Personally, I have a problem with the Active Directory methods. If you use the Active Directory OU approach, a XenApp server cannot belong to multiple worker groups. Using Active Directory for worker group membership requires the use of a second console (Active Directory Users and Computers). Using Active Directory for worker group membership requires the admin have rights to modify Active directory groups or OUs. Using Active Directory requires duplication of effort. You have to build your worker group structure in XenApp, then create a similar structure in Active Directory. But for those who do use the Active Method, you might be wondering how you can create the same structure in XenApp 7.x. Add to Delivery Group: In the search node, an admin can select a specific machine identity and add it to a particular delivery group. This approach allows the admin to be specific about which machine ID should belong to which delivery group. This approach is similar to using Active Directory groups as it allows the admin to be specific about which machine belongs to which group. I tend to see the XenApp 7.x approach to be easier in that I can do it all from a single console, Studio.